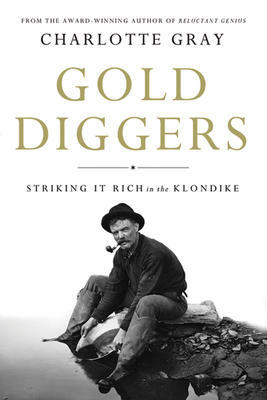 If you’ve ever wondered about what really happened in the Gold Rush, the Klondike, and Dawson City, this is the book to set you straight. Biographer/historian Charlotte Gray has done a wonderful job of bringing these legendary spots to life. She takes six characters and follows their lives as the north beckons and gold may or may not fill their pockets. There are good clear maps and we can follow the miner as he backpacks ever further north; the saintly priest who keeps his “church” going long before any building was put up; the young writer Jack London who kept notes for his later books even though he could hardly stand up from scurvy. There was the spit ‘n polish Mountie and two unusual women: one a feisty business woman who wore starched blouses and ran a hotel, the other an imperious British journalist from The Times. In the late l800’s these people first followed rumours of gold up in the Chilkoot Pass. Later they stampeded further north to what soon became Dawson City. The trail was horrendous; they had to carry in a year’s worth of food, clothing, equipment. Gray herself rafted down a section of the wide Yukon river in 2008 and gives vivid descriptions of the majestic countryside. There are also good photographs of the wild, muddy boom town that Dawson City became. The Gold Rush produced many myth-makers, apart from Jack London, including Robert Service and the Canadian writer, Pierre Berton who was the son of a Klondike stampeder and spent the first ten years of his life in Dawson City. Like Charlotte Gray’s other books on historical figures in this country, this does not feel like myth – but rather the true story, and quite fascinating.